Closest matchup: New prevailed against old in a tightly contested battle as modern JRPG Xenoblade Chronicles defeated timeless classic Super Mario Bros. by a handful of votes. Biggest Blowout: In a battle of handheld Zelda, the gold standard, Link's Awakening, made short work of The Minish Cap. 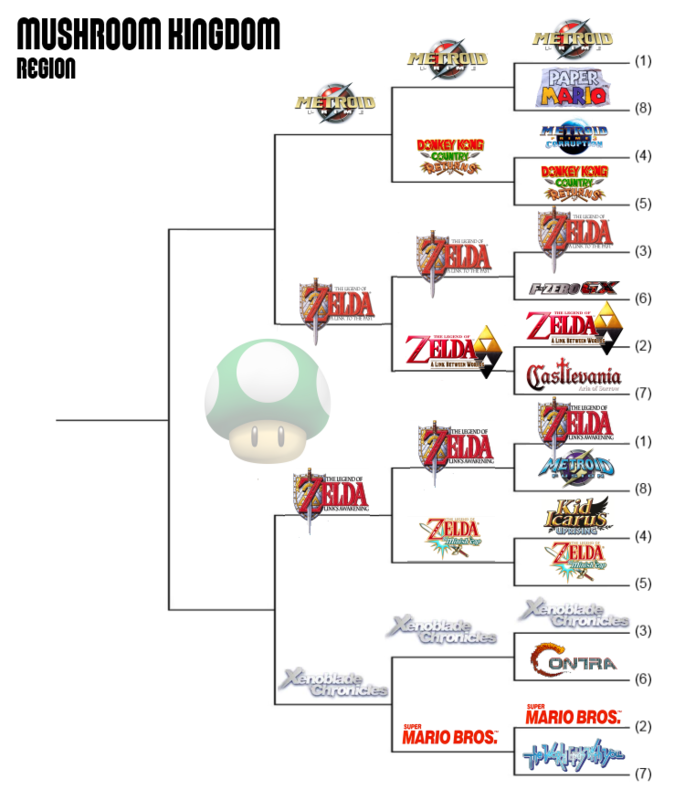 Lowest Seed Standing: Xenoblade Chronicles and The Legend of Zelda: The Link to the Past, 3 seeds, are the lowest remaining in this region, where the favorites generally took care of business. Do you think we'll see a Wii U GamePad Plus? Oh boy...Prime vs. LttP is going to be a doozy. Wait, how on Earth was Link to the Past seeded below Link Between Worlds!? It has a higher average, more ratings, etc. it should be a higher seed! I divided the games into 8 groups (NES, SNES, N64, GCN, Wii, GB/GBA, DS, Wii U/3DS) and seeded within the groups. I voted for Super Mario Bros. but I'm not disappointed Xenoblade made it. Next Mushroom Region voting session will be hell. I don't think there have been any surprises in this bracket. Aww man, I thought Mario was gonna do it.